Refuel after your workout with these delicious sweet potato pancakes. 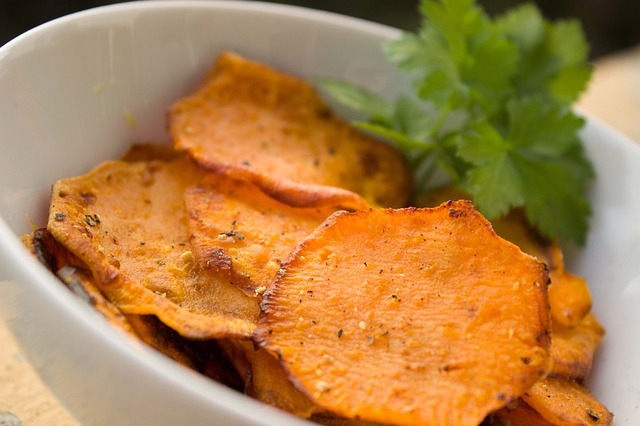 Not only are they delicious and versatile, sweet potatoes are packed full of replenishing nutrients! In several studies from Africa, sweet potatoes were found to contain between 100-1,600 micrograms (RAE) of vitamin A in every 3.5 ounces—enough, on average, to meet 35% of all vitamin A needs, and in many cases enough to meet over 90% of vitamin A needs. Add some fat in there and you’ve got a great recipe post-workout…and on a chill evening in winter! Peel sweet potatoes and cut in chunks. Boil until soft (I prefer to cook enough sweet potatoes to last the week to save having to do this step every time). Pre-heat non-stick frying pan on medium heat with coconut oil. Combine all ingredients in the blender–except coconut oil, syrup and blueberries. Blend on high for 30 seconds. Pour batter in the frying pan and add blueberries. Cook until one side is done, flip and cook the other. Top with maple syrup and enjoy!